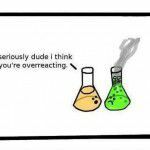 A chemical reaction occurs when one set of chemical substances transform into another. When a chemical reaction occurs, a change is made, and in this instance, the beaker on the left is observing the intense chemical reaction of the one on the right. 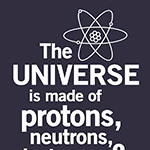 Atoms consist of protons, neutrons, and electrons (subatomic particles). 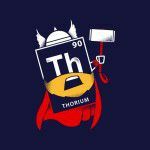 The reference to the universe being made of these alludes to atomic matter that exists in the universe, which includes morons, a.k.a. stupid people. 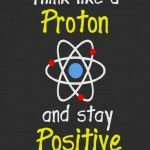 Protons are the positively charged subatomic particles of an atom. Can I Take Your Drink Order? 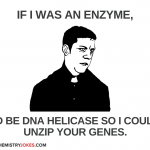 H2O is water. 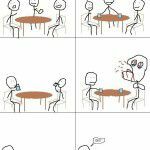 When the second chemist says “…I’ll have some H2O too”, the server interpreted the request as H2O2, which is hydrogen peroxide. Hydrogen peroxide can cause severe internal damage when ingested. A. 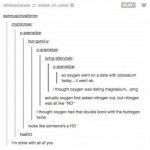 If you can’t helium and you can’t curium, then you might as well barium. 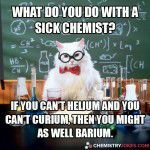 Helium, curium, and barium sound like the terms “heal him”, “cure him”, and “bury him”; therefore, if you can’t heal him and you can’t cure him, then you might as well bury him. 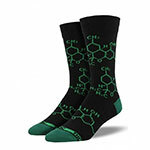 The responses are also the elements’ period symbols in the creation of a chemical compound. 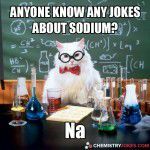 The period symbol for sodium is Na. 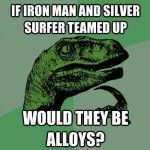 An alloy is a metal that is made up of two or more metallic elements, in this case iron and silver. Alloy is also a play on the work ally: an associate with a mutual desire or connection. 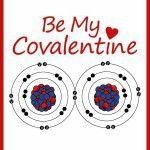 Covalent bonding occurs when atoms share electrons. 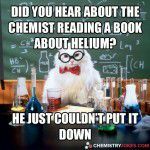 Did You Hear About The Chemist Reading A Book About Helium? 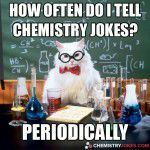 Helium is lighter than the elements that make up air. When it fills a balloon, the balloon will float.